This classic first-series Mustang Hardtop has been recently discovered in an old barn. The bearded farmer is showing the little treasure to the young car hunter, wearing a black leather jacket. Despite it was recovered in a dusty shed the machine looks in great shape, with all the details on the right place. Once out of the barn a mechanic is trying to start the engine. The Mustang probably needs only a new battery. 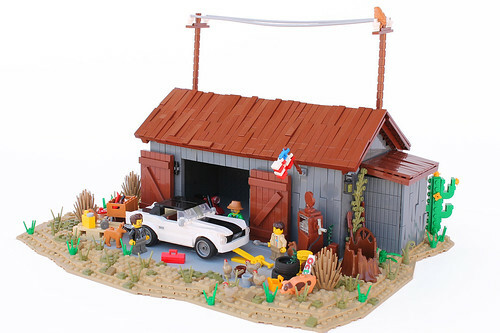 Called "Americana" this little diorama is my entry for LEGO Ideas contest Celebrate your favorite ford mustang in a beautiful scenery! It features all the details you'd expected to see in a scene like that: an old barn with chickens and pigs scratching around, old spare parts and tyres, a rusty 50s gas pump and other stuff all around. Last but not least "The Star Spangled Banner" flag waving proudly out of the shed. The Hardtop was the first version of the Mustang, introduced on April 17, 1964, together with the convertible. The fastback version was put on sale a bit later, in August 1964. Personally I really like the hardtop design.